Last edited by pdog05; 08-02-2015 at 02:49 AM. I moved this to another section for a better answer....Thanks for joining HAF. Yes, you can install an aftermarket radio and still have use of the screen for vehicle functions. The kit is expensive ($400) and a bit buggy because it uses an Android-based interface for mimicking the factory system for fuel data. If you want to send video to the 8" screen, you can get an interface for $300 by Naviks. you didn't buy the $400 interface so you don't get to use the factory screen or rear view camera. You may recall not using all of the harnesses that were plugged into the factory radio. one feeds the screen, one handles ANC, another for USB, and another has the rear camera feed. from the install instructions on the 99-7804B you can see what is required. The interface uses the steering wheel controls to command the factory screen (since the factory radio controls are gone). note that in order to build an interface for the factory screen, the control in the factory head unit needed to be replicated - not just control but processing. the factory radio was never intended to be removed. like many modern vehicles, it is integrated with more than just music, it displays fuel data, vehicle preferences, and handles video switching for the rear view camera (and lane watch camera on higher models). Metra came out with an expensive interface to allow consumers to retain full factory control but it took a lot of time to develop. some have had luck snagging the video signal from the factory rear camera by hacking the wiring, and others have just removed it and added an aftermarket camera made to work with their new head unit. simply put without the 99-7804B you don't get the factory screen control back. with a Naviks interface you can only mirror your double din. Last edited by keep_hope_alive; 08-02-2015 at 08:17 PM. 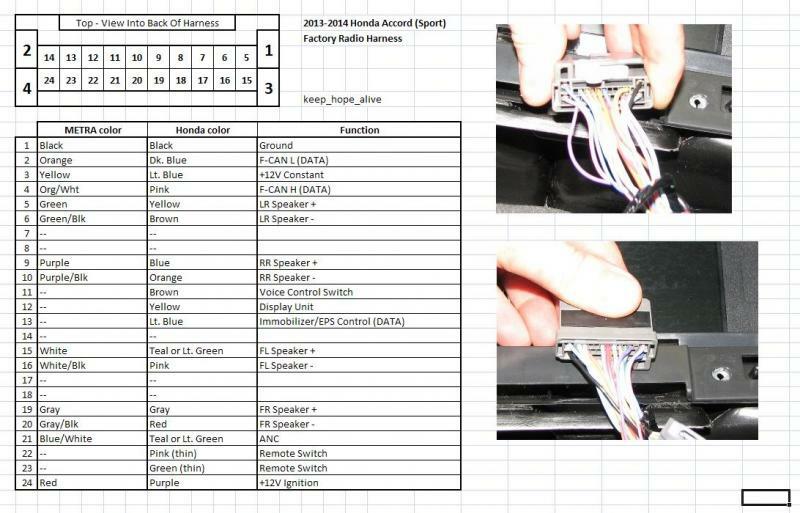 here is a link to the wiring diagram for the 2014 Sport (non-touchscreen). from that link you can get a full res version and see what every harness does. you'll also note that the radio harness was missing wires. this table identifies each wire and what the Metra harness lacks.